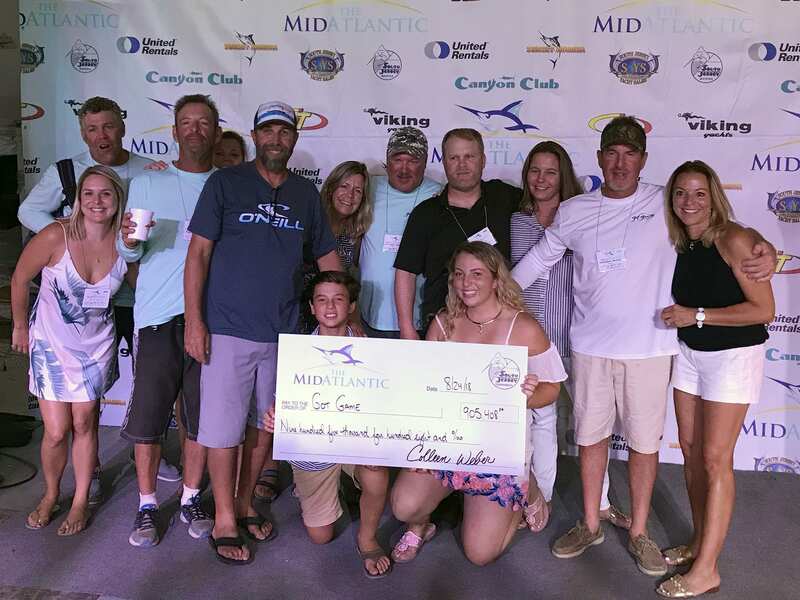 The 2018 MidAtlantic, the 27th edition of sportfishing’s “Main Event,” came to an exciting close for the 157 participating boats and crews with award ceremonies featuring lavish buffet dinners and record cash payouts for numerous winners celebrated at Canyon Club Resort Marina in Cape May, New Jersey and Sunset Marina in Ocean City, Maryland. The week saw numerous records set once again including a cash purse of well over $3.36 million up for grabs, record single payouts for the top winners in the white marlin and tuna categories and a record number of blue marlin (55) caught and well over 750 white marlin released! The final day of the 2018 MidAtlantic dawned sunny and clear with a light breeze and full moon in the sky. Once again, a bit of tournament history was set as for the first time in the event’s 27-year history the entire fleet of 157 boats was eligible to fish on the final day. Day Five saw several changes on the leaderboard on what has traditionally been called Moving Day at the MidAtlantic. This event was the first billfish tournament to use the phrase in reference to the major shake-ups which occur on the leaderboard and this year would be no different. Sea conditions improved dramatically from the previous day and the billfish bite continued its scorching pace. Florida. For their efforts Gusto received $169,466 while FFMD netted $141,376. A record setting 55 blue marlin were caught during the tournament and two were weighed on Day Five though both fell short of the event’s 400-pound minimum weight. As a result, the blue marlin prize money was equally divided among the winners of the white marlin category. Though numerous tuna were weighed on Day Five all fell short of the leaderboard. Ed Dunn’s DA Sea from Grasonville, Maryland captured the top prize and a record payout $571,289 for their 116-pound big eye caught on Day Two. Captain Mark DeBlasio’s Blue Runner from Manasquan, New Jersey and Chad Jackson’s Toddy Time from Ft. Meyers, Florida tied for second place with big eyes of 114 pounds which were both caught on Day Two. DeBlasio received $209,260 while Jackson walked away with $114,790. Third place and $16,807 went to Curtis Campbell of Baltimore, Maryland with a 111-pound big eye caught aboard his Reel Estate on Day One. Jim Rodgers’ First Light from Hobe Sound, Florida took the heaviest dolphin award and won $27,847 for his 43-pounder caught on Day Two while John League of Annapolis, Maryland finished in second place aboard his Espadon with a 34-pounder caught on Day Four and took home $54,731. Chuck Weishaar’s The Natural from Hampstead, Maryland had the third heaviest dolphin which was also caught on Day Two at 33 pounds and won $25,004. Ed Zajdel of Ocean City, Maryland won the wahoo category with his 71-pounder caught aboard The Zipper on Day Two and received $19,787 while Michael Chase of Villanova, Pennsylvania aboard his Contrail finished in second with his 49-pounder caught on Day Four and took home $50,149. Chase also weighed a 46-pounder on Day Five which moved him into a tie for third place with Joe Posillico’s Torta from Farmingdale, New York who weighed his 46-pounder on Day Two. Posillico received $23,735 while Chase received and additional $18,753. Some of the boats with significant billfish catches on Day Five include Art Kontos’ Let it Ride and Tim Tanghare’s Big Oil with eight white marlin released each while Michael Savino’s Texas Tea released seven white marlin. Thomas Colquhoun’s Special Situation, Anthony Martina’s Sea Wolf and Anthony Matarese’s Reel Chaos each let go six white marlin. Jeff Donohue’s Hatterascal released five white marlin while John Gudelsky’s Reel Joy, Patrick Kannan’s Waste Knot, Stephen Lewis’ MR Ducks and Tom Perry’s No Limits each released four white marlin. Larry Hesse’s Goin’ in Deep let go three white marlin and a blue marlin. Jon Duffie’s Billfisher, Kenneth Hager’s Taylor Jean, Nick Rodriquez’s Par 5, Greg Hill’s Wanted and Edward’s Bondarchuck’s Moore Bills each released a blue marlin and a white marlin. Mike Yacco’s MJ’s released three blue marlin while Don Haines’ Shelly II and Hank Draper’s Prime Hook each released two blue marlin and a white marlin. Ed Dunn’s DA Sea and Bill Haugland’s Lights Out each released a blue marlin. Please note well over 60 individual cash awards are possible due to the wide variety of Calcuttas. See below the payout for the species indicated and please note payouts vary by the number of Calcuttas each participant enters. It should be noted that no less than eight winners received a payout of more than six figures and an additional eight winners received payouts of $25,000 or more! Heaviest Blue Marlin – No qualifying blue marlin weighed. Prize money divided equally between white marlin category winners. **Ties broken based on time of catch. Worthy of note is a total of 818 billfish including 765 white marlin and 53 blue marlin were released which translates to a catch-per-unit-of-effort of 1.73 billfish per-boat per-day! That’s the second highest CPUE in the event’s 27-year history behind 2016 which saw a 1.78 CPUE with the same number of entries in the tournament. As a reminder the 2018 MidAtlantic is accessible through the South Jersey Tournaments App. Be sure to download this free app today for your IOS or Android device from the Apple App and Google Play where you can see all the action from the entire week. For further information contact Tournament Director Aaron Hoffman at 609-884-0177. Be sure to visit the tournament’s official web site at www.themidatlantic.com where you’ll find all the facts, figures and information about this year’s event including a complete rundown of the winners, Calcutta payouts, rules and points. There’s also a link to purchase official tournament merchandise. You can also review all the week’s action on Facebook at The MidAtlantic Tournament; on Twitter; @midatl and on Instagram; @themidatlantictournament.